Ladies & Germs: your potential (read:probable) Attorney General. The nominee who believes in shutting down the Mueller investigation. The nominee thinks "there are things that to be investigated" - but he means Hillary, not BLOTUS. The nominee who does not believe sitting presidents can be prosecuted. Oh - and he plays bagpipes.......which, even with all the prior things listed, actually might be the most offensive thing about him. And you still all might pooh-pooh the fall of Germany to the Nazis, but you might want to take a look at the tweet from the confirmation hearings on Bill Barr Baggins (ok, I added the 'Baggins' part). BLOTUS has been systematically undermining the legitimacy of the press while still empowering State TV (FOX). 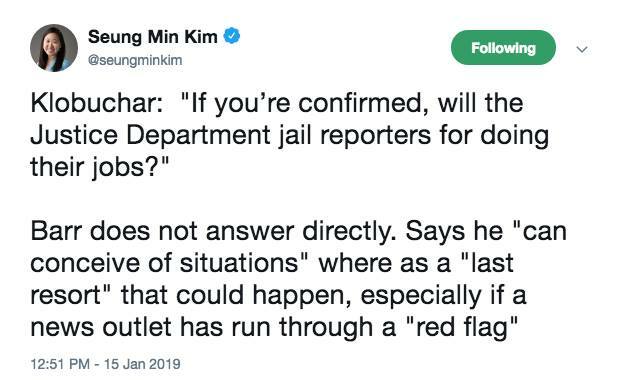 Barr is seemingly unconcerned about taking it a step - or 17 - further: criminalizing reporters. Who else has control of - and / or punishes - the media....oh.......who........is.......it? Oh right, every dictator ever. So - let me get this straight. Our potential Attorney General would actually and actively go against the Constitution. You know - the document that governs the laws of this nation. So - chew on that for a while. ...............since I'm running on government paranoia, let's talk shutdown. Yes. Again. Did you know the Federal Court system runs out of funds in seven more days? Didya? Well, they do. You do realize how fragile the current Justice system already is with this administration, right? And how Individual 1 has ignored you know, the FBI, tried to thwart them, skirted or out and out ignored laws, blah blah blah. So, hey, let's remove one more barrier: the Federal court system. You know, that one system, where say, an "activist judge" (read: one who follows the prescribed set of laws), overturns bans on refugees, or blocks changing the census, or voids changes to Planned Parenthood, or the one who makes caged children be reunited with their parents. Silly things like that. But where are the checks and balances when the government actually shuts down the federal court system? That question is actually not rhetorical. JFC! I did not know that about the federal court system! we are fucked!